Like Cadbury, Dove and Summer's Eve before it, Nivea may have just landed itself in hot water for a questionably racist ad. As seen on Good, Nivea has created a series of print ads for its Revitalizing line of men's skincare that feature well-groomed men tossing away masks of their scraggly, pre-Nivea faces. The one featuring a white model reads, "Sin City isn't an excuse to look like Hell." The spot featuring a black model says, "Re-civilize yourself." Both ads fall under Nivea For Men's broader campaign, "Look Like You Give A Damn." None of the other ads included, however, make use of the "civilize oneself" angle. Nivea's pick of slogans might have been entirely arbitrary. But, as many argue, it could be that the brand is playing on one of the most pervading racial stereotypes applied historically to the black community. Take a look at the ad below and let us know -- is this advertisement offensive or innocent? UPDATE: As of late afternoon on Thursday, Mashable writes, Nivea has pulled the ad in the wake of the backlash. 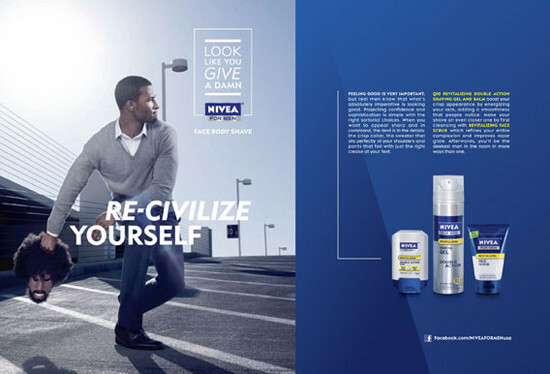 The skincare company wrote on its Facebook page, "Thank you for caring enough to give us your feedback about the recent "Re-civilized" NIVEA FOR MEN ad. This ad was inappropriate and offensive. It was never our intention to offend anyone, and for this we are deeply sorry. This ad will never be used again. Diversity and equal opportunity are crucial values of our company."